When people in Wood River, Illinois, need compassionate legal assistance after getting hurt in an accident, they turn to our law office, Unsell, Schattnik & Phillips, P.C. With decades of combined experience, our skilled attorneys are able to deliver knowledgeable and aggressive representation for victims and their families all over Madison County. We routinely handle cases involving car accidents, slips and falls, defective products and medical malpractice. Additionally, we offer niche counsel for workers’ compensation matters. No matter how our clients became injured, we advocate relentlessly to obtain the maximum possible settlement in negotiation and litigation. Although we cannot take away the physical pain and suffering, we work to secure compensation that offsets the costs of medical treatment, emotional trauma, lost income and hindered earning potential. When we are not overseeing personal injury cases, our law office is defending clients charged with crimes. Attorney Daniel Schattnik started his legal career as an assistant state's attorney for Madison County. There, he prosecuted hundreds of felony cases. He is able to leverage his prior prosecution experience to represent people facing a broad array of state and federal allegations. Whether charges are misdemeanor or felony, Mr. Schattnik remains undaunted in court. Our law office also takes cases pertaining to estate planning and probate distribution. We regularly assist with the creation of wills, guardianships, powers of attorney and other important directives. 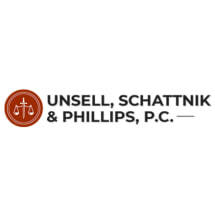 Unsell, Schattnik & Phillips, P.C., invites all prospective clients to meet with us at the firm for a free initial consultation and candid evaluation.